1. The number of hazards you meet. 2. The rate at which you meet the hazards. 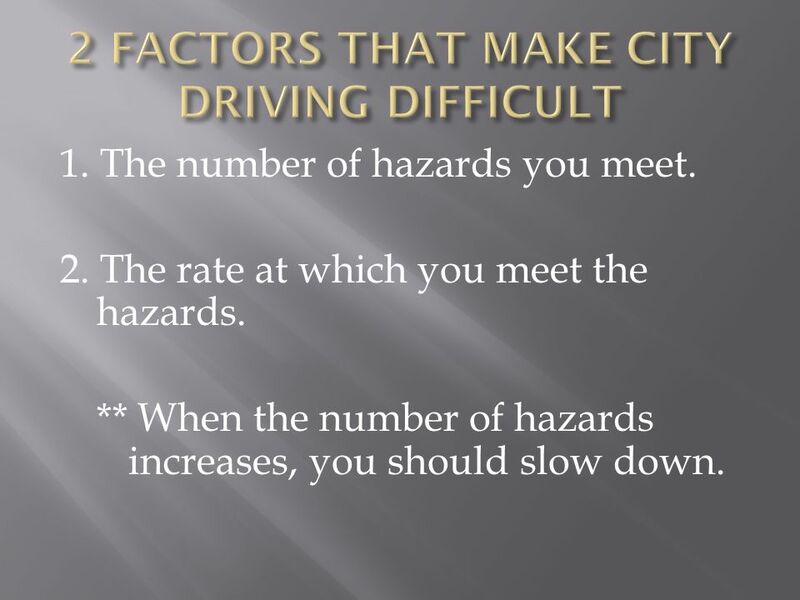 ** When the number of hazards increases, you should slow down. 1. You can see farther down the road. 2. You have more time to adjust to traffic. 3. You avoid the vehicle ahead if it stops suddenly. 6 3 SECOND FOLLOWING RULE This is the best way to measure your following distance. 1. Pick a stationary object down the road. 2. When the vehicle ahead of you passes the object, count to 3. 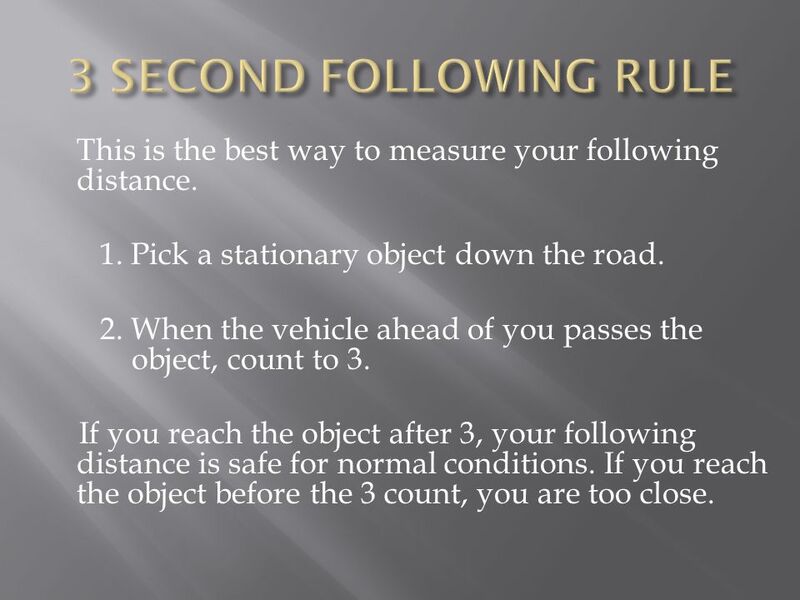 If you reach the object after 3, your following distance is safe for normal conditions. If you reach the object before the 3 count, you are too close. 7 INCREASING FOLLOWING DISTANCE TO 4 OR MORE SEC. 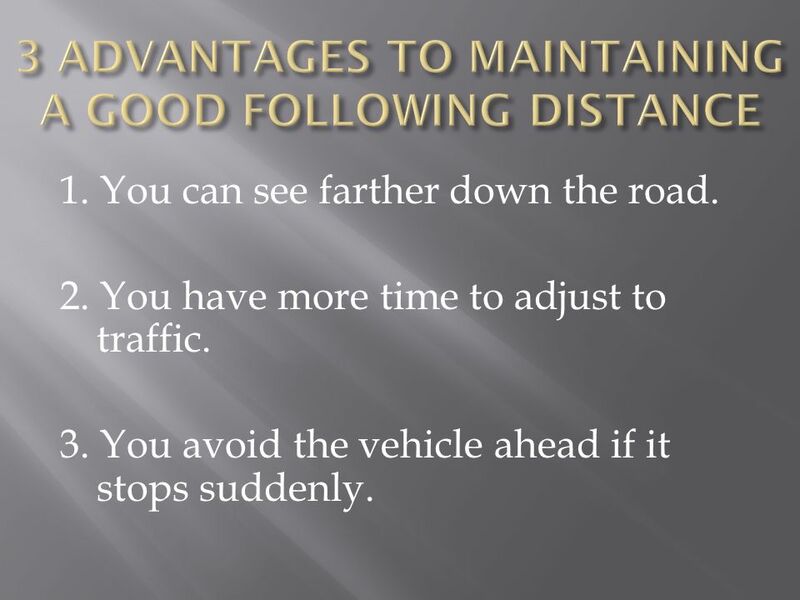 Maintain extra distance when: 1. Under adverse conditions. 2. You are first learning to drive. 3. 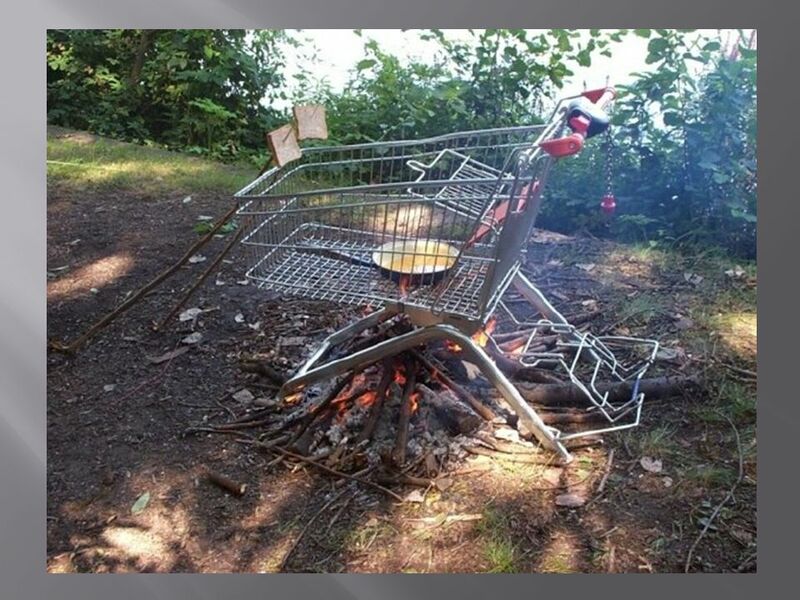 You are tailgating or being tailgated. 4. Traction is poor. 5. 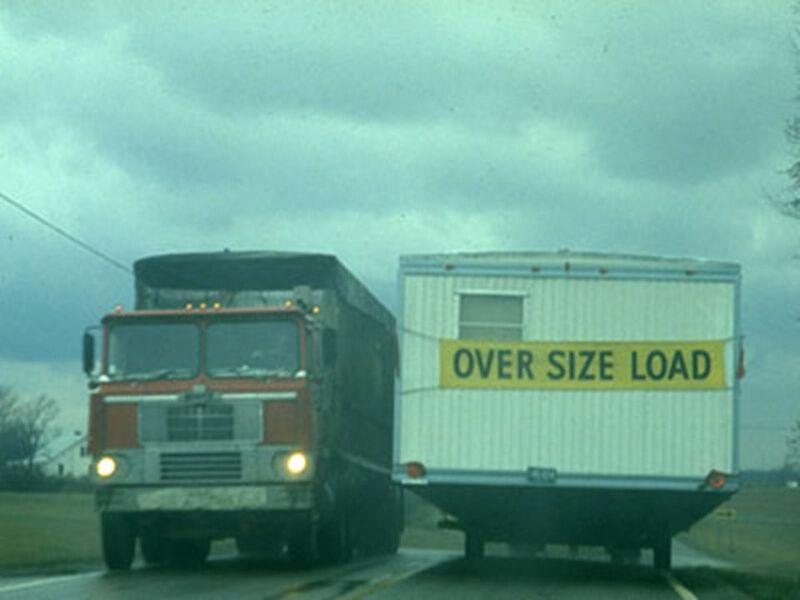 You are pulling a heavy load. 8 INCREASING FOLLOWING DISTANCE TO 4 OR MORE SEC. 6. You are driving downhill. 7. The driver ahead seems unsure. 8. You are following a motorcycle. 9. You are approaching a line of sight restriction. 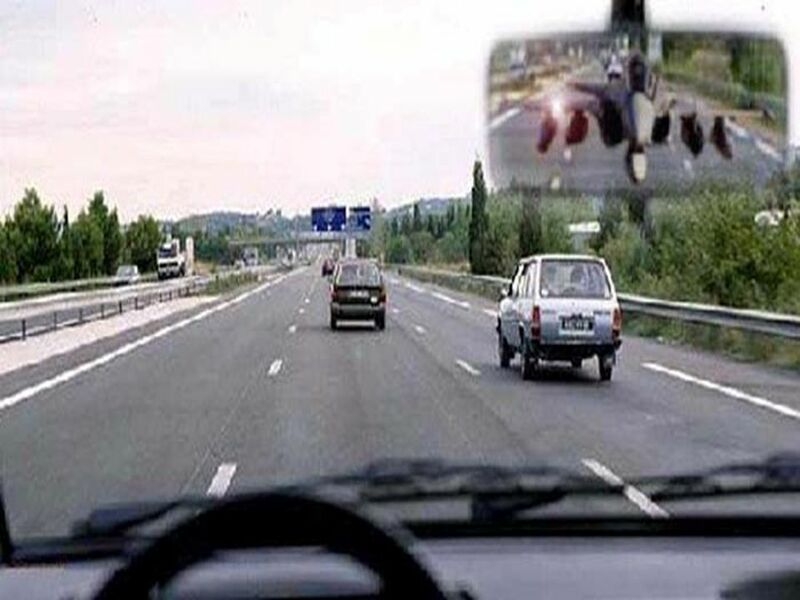 Look over, through, and around the car that’s ahead of you. 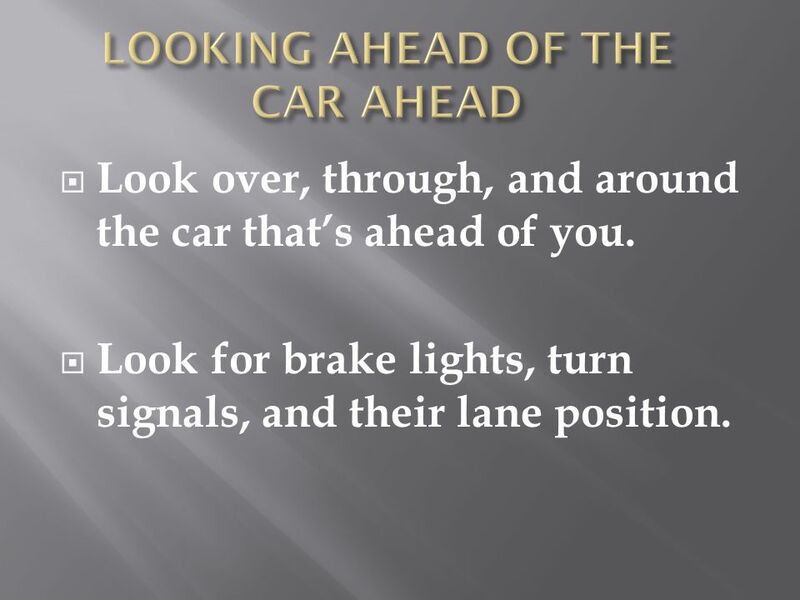 Look for brake lights, turn signals, and their lane position. 1. Intersections with signal lights. 2. Lanes next to parked cars. 3. Parking lot entrances and exits. 11 DID YOU KNOW? 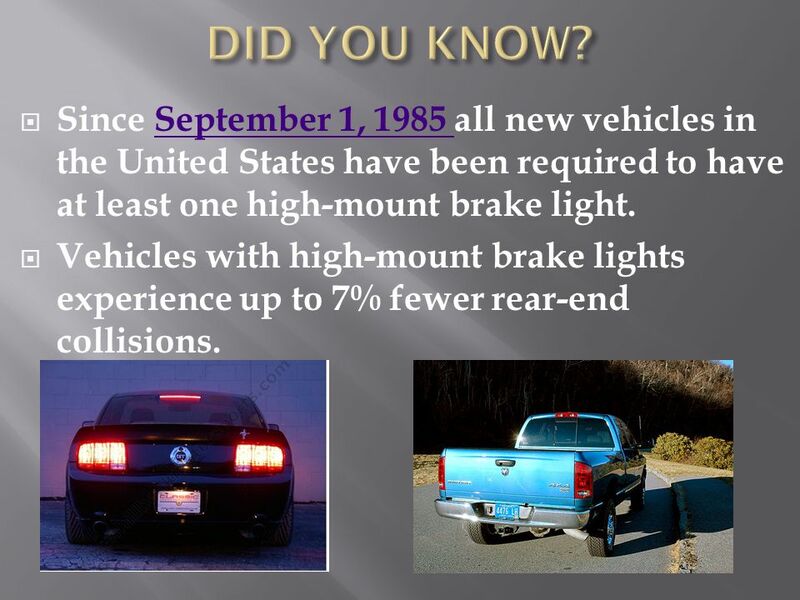 Since September 1, 1985 all new vehicles in the United States have been required to have at least one high-mount brake light. Vehicles with high-mount brake lights experience up to 7% fewer rear-end collisions. 12 LOOKING AWAY SAFELY Quick glances rather than a long look. Make sure the zone ahead of you is open before you look away. 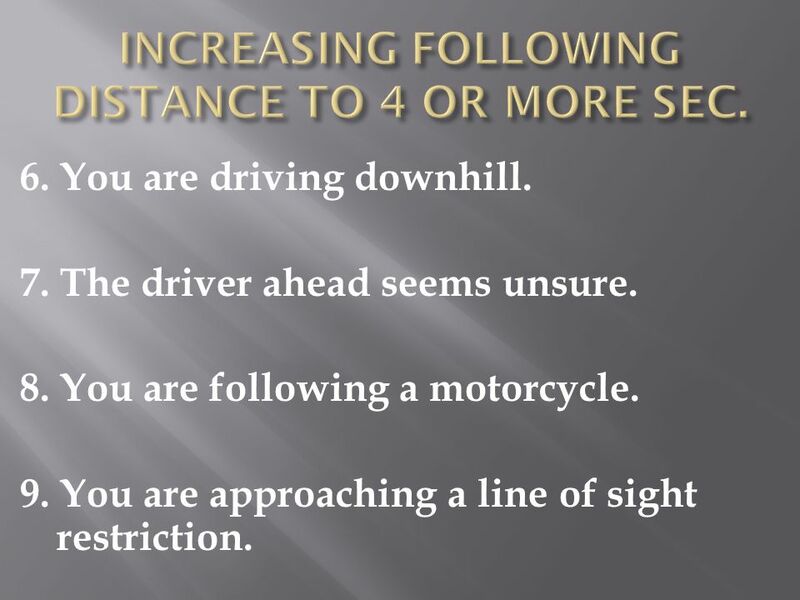 Increase your following distance. 13 3 TYPES OF TAILGATERS Chargers – approaches with excessive speed and wants to pass. 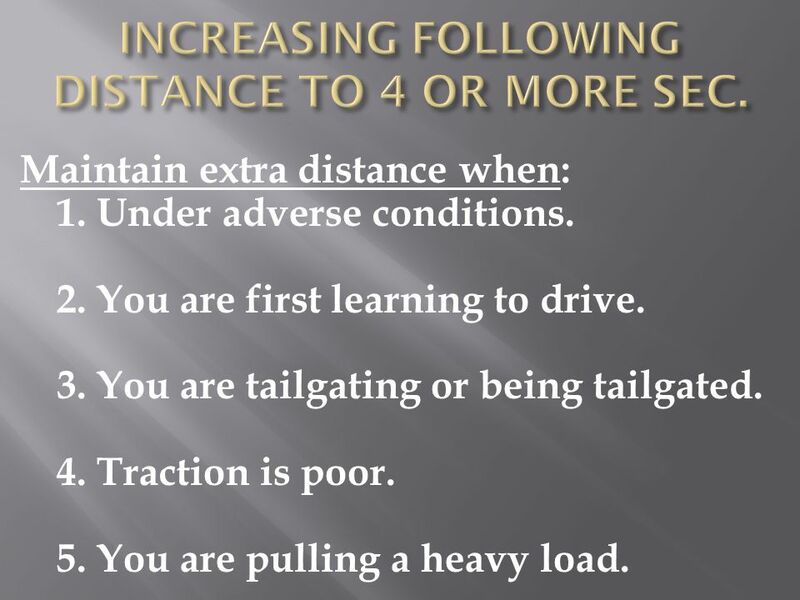 One-Pace Tailgaters – likes to travel at a set pace – often above speed limit, gradually approaches your vehicle. 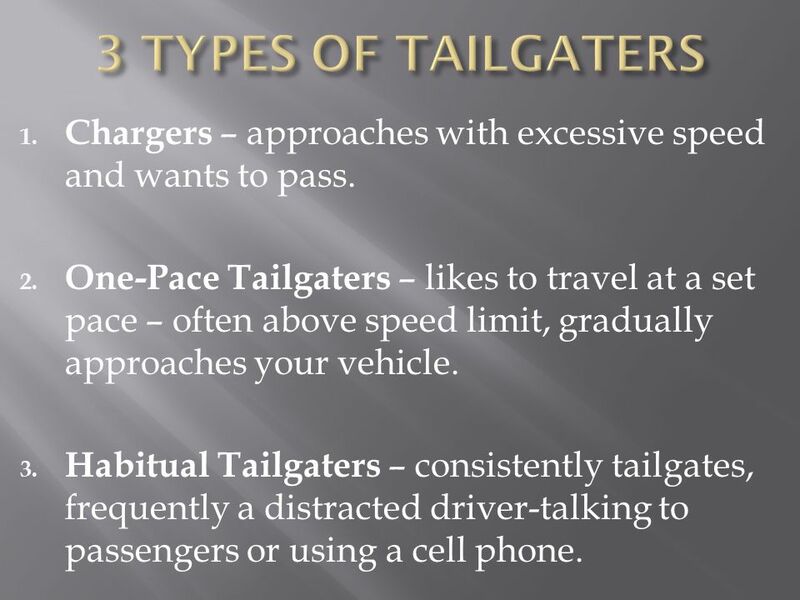 Habitual Tailgaters – consistently tailgates, frequently a distracted driver-talking to passengers or using a cell phone. 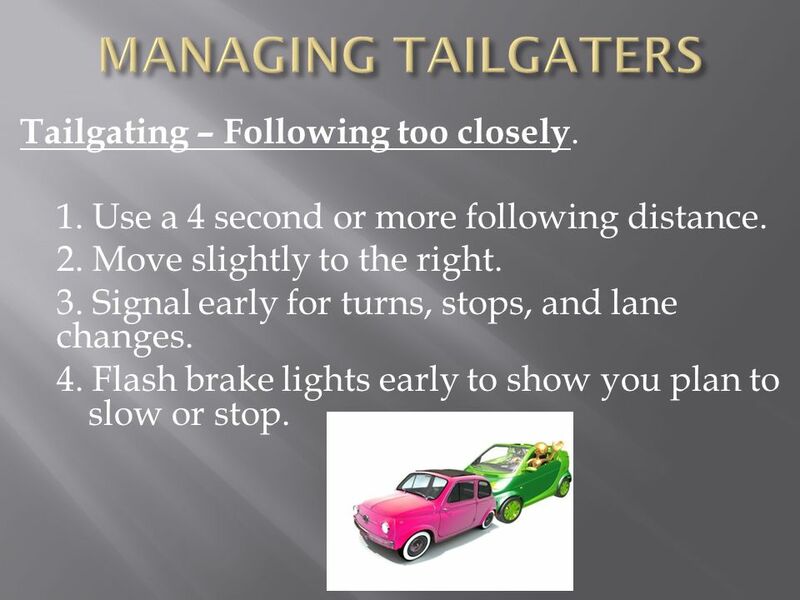 15 MANAGING TAILGATERS Tailgating – Following too closely. 1. Use a 4 second or more following distance. 2. Move slightly to the right. 3. Signal early for turns, stops, and lane changes. 4. Flash brake lights early to show you plan to slow or stop. 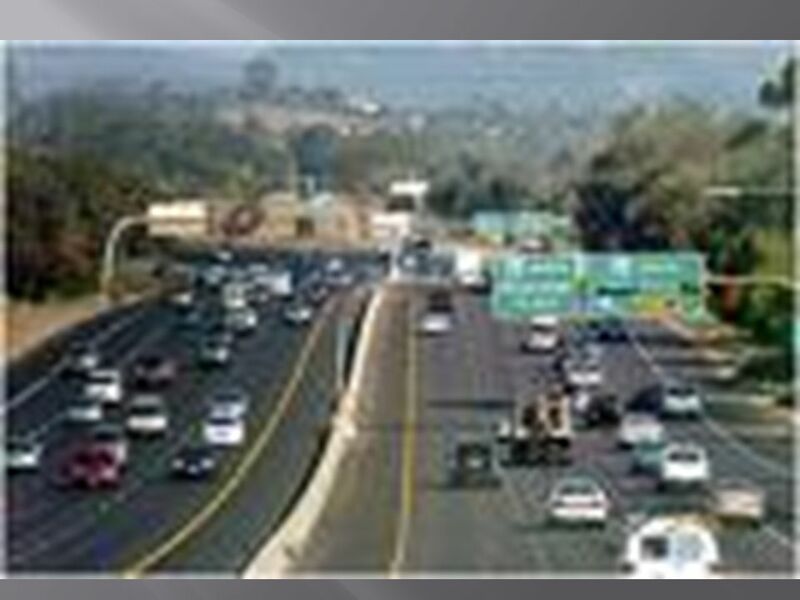 Slow until other driver can return to the normal lane or give you more time to manage available space. Turn on or flash your headlights and blow your horn. 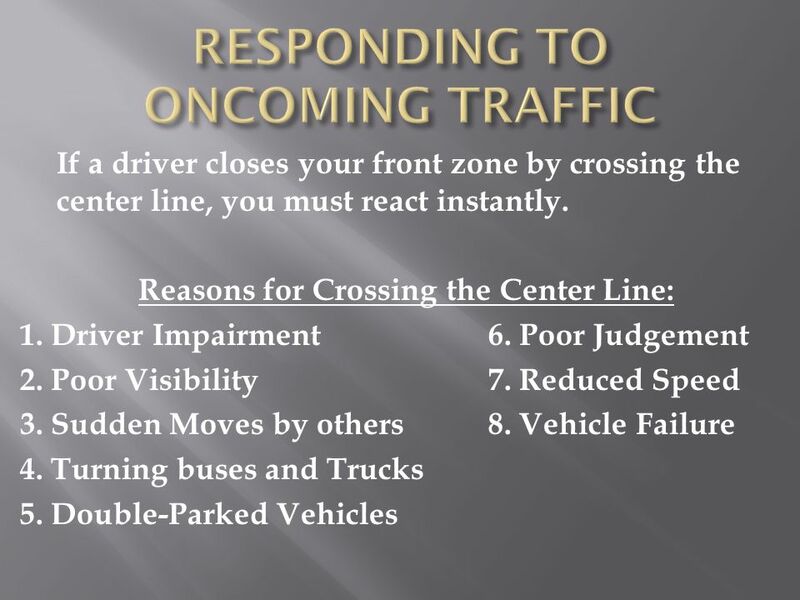 If your right-front zone is open, move to the right to give the oncoming driver more room. 18 LOOKING AHEAD Look at least 1 block ahead. 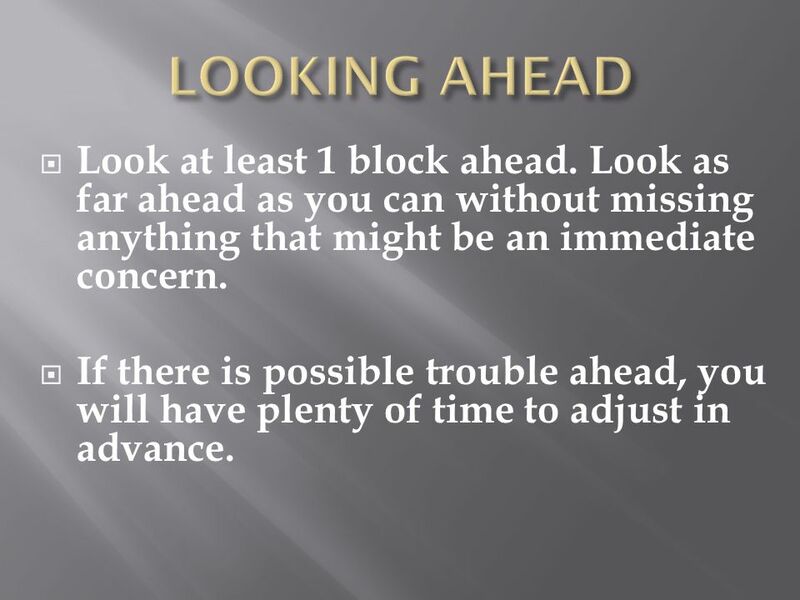 Look as far ahead as you can without missing anything that might be an immediate concern. If there is possible trouble ahead, you will have plenty of time to adjust in advance. RED LIGHT : 1. Slow and prepare to stop. Don’t speed up to get to a red light. 2. Check the traffic lights of cross traffic. 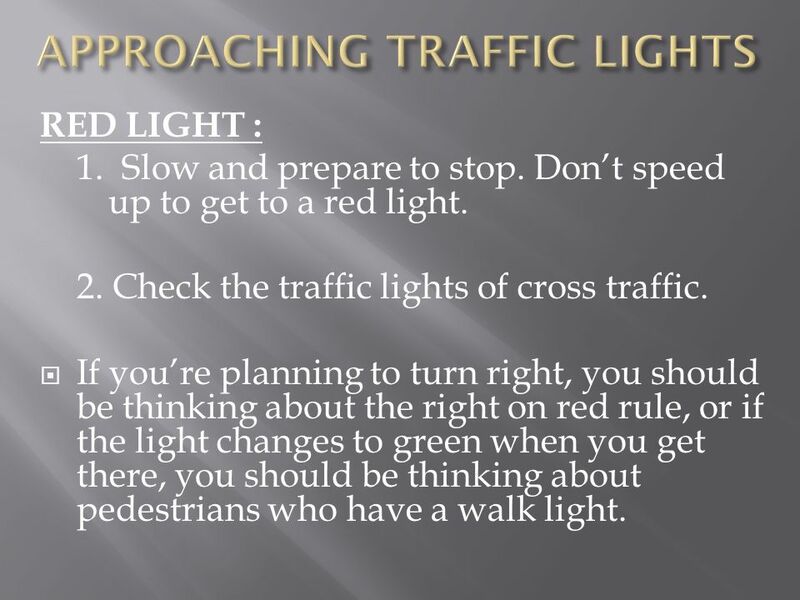 If you’re planning to turn right, you should be thinking about the right on red rule, or if the light changes to green when you get there, you should be thinking about pedestrians who have a walk light. 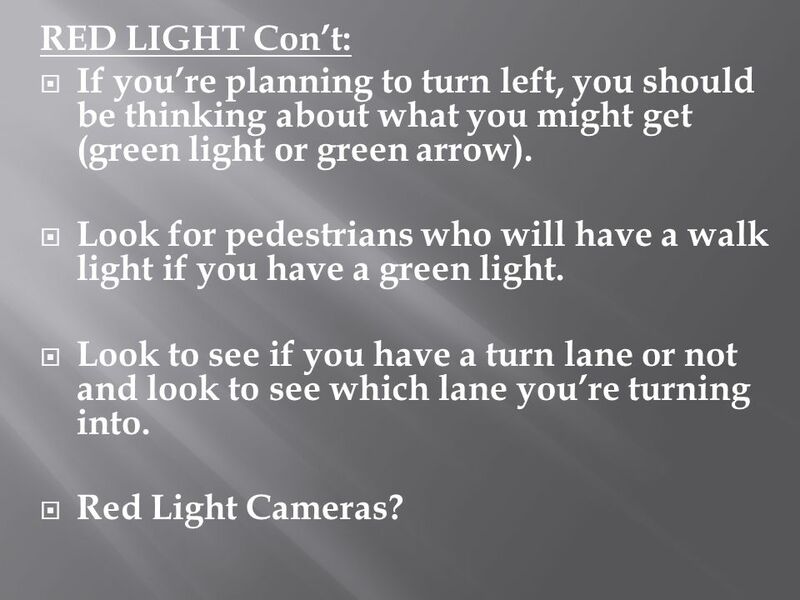 22 RED LIGHT Con’t: If you’re planning to turn left, you should be thinking about what you might get (green light or green arrow). Look for pedestrians who will have a walk light if you have a green light. 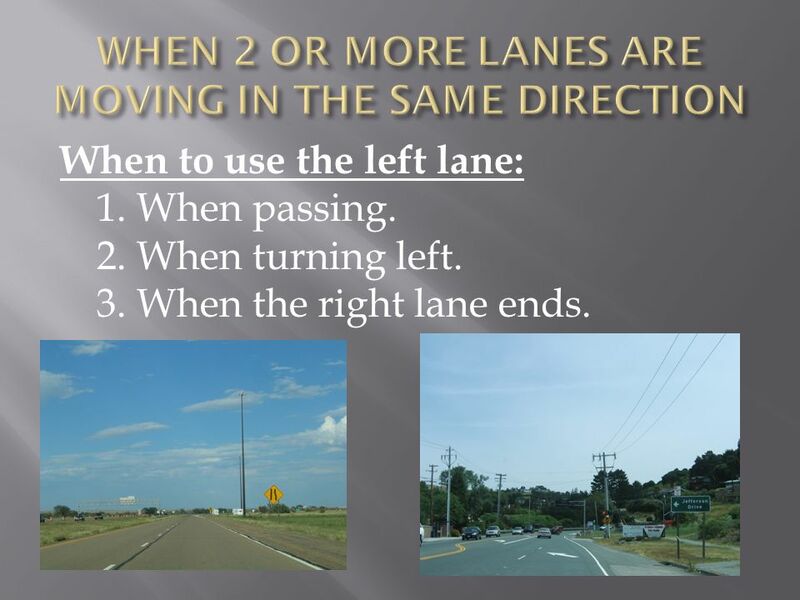 Look to see if you have a turn lane or not and look to see which lane you’re turning into. Red Light Cameras? 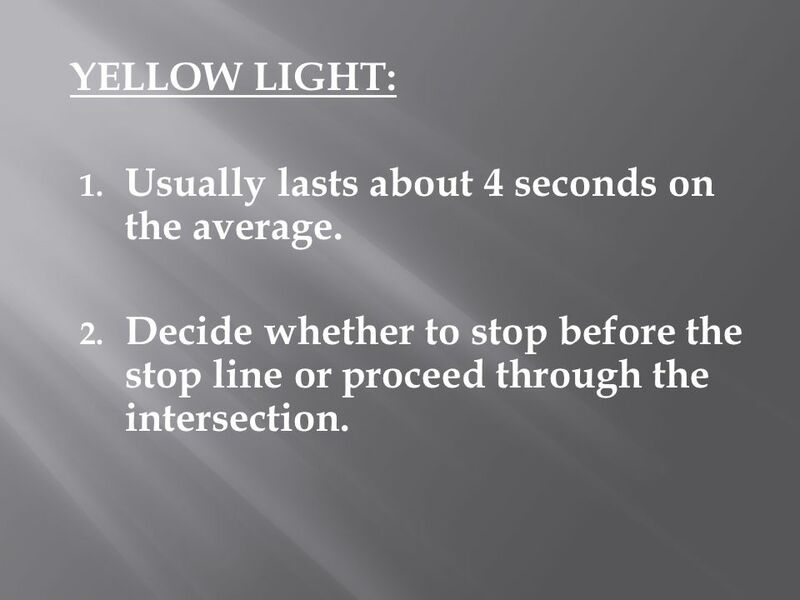 23 YELLOW LIGHT: Usually lasts about 4 seconds on the average. 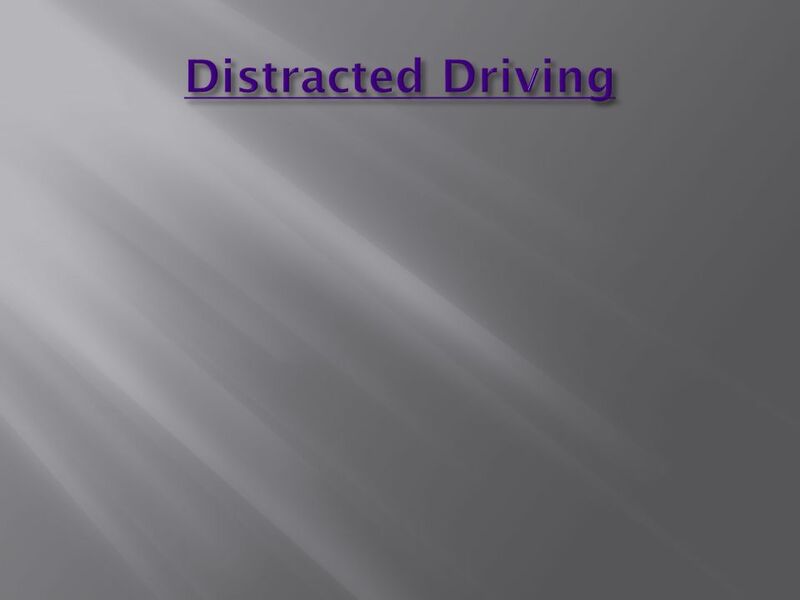 Decide whether to stop before the stop line or proceed through the intersection. 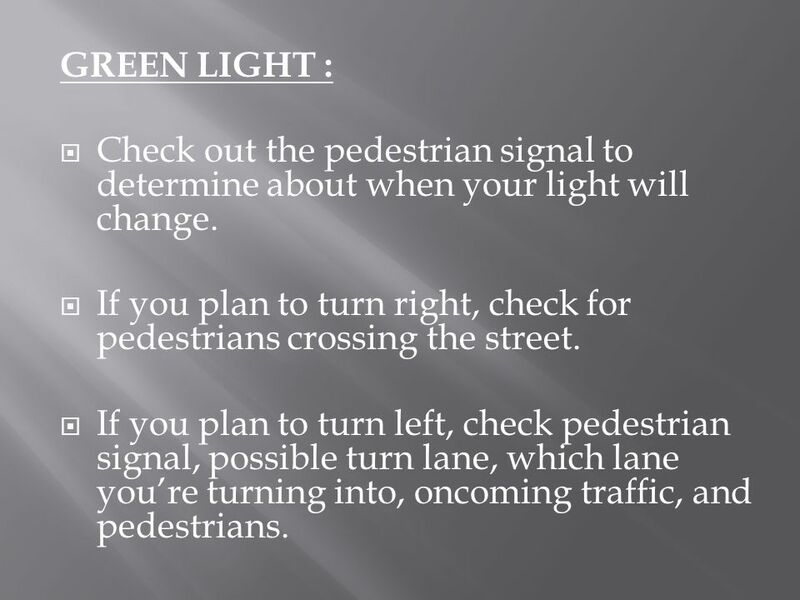 24 GREEN LIGHT : Check out the pedestrian signal to determine about when your light will change. If you plan to turn right, check for pedestrians crossing the street. If you plan to turn left, check pedestrian signal, possible turn lane, which lane you’re turning into, oncoming traffic, and pedestrians. 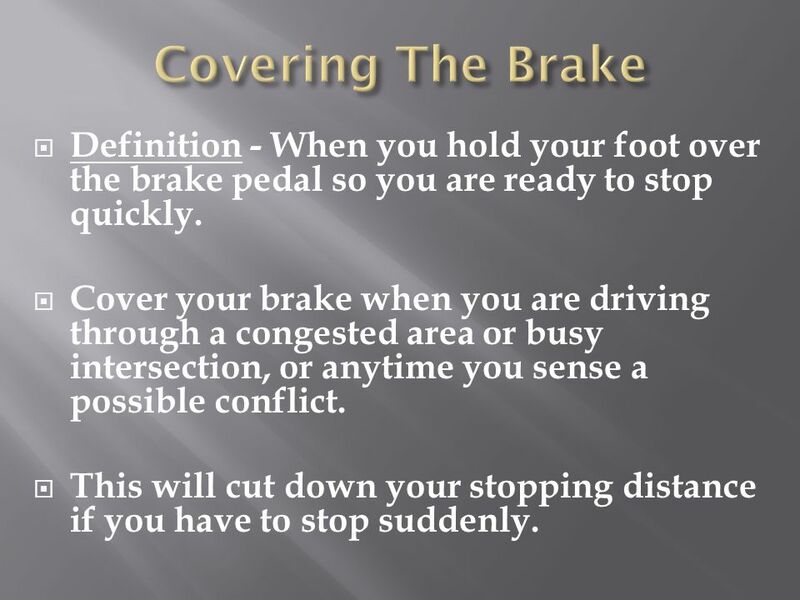 25 Covering The Brake Definition - When you hold your foot over the brake pedal so you are ready to stop quickly. Cover your brake when you are driving through a congested area or busy intersection, or anytime you sense a possible conflict. This will cut down your stopping distance if you have to stop suddenly. 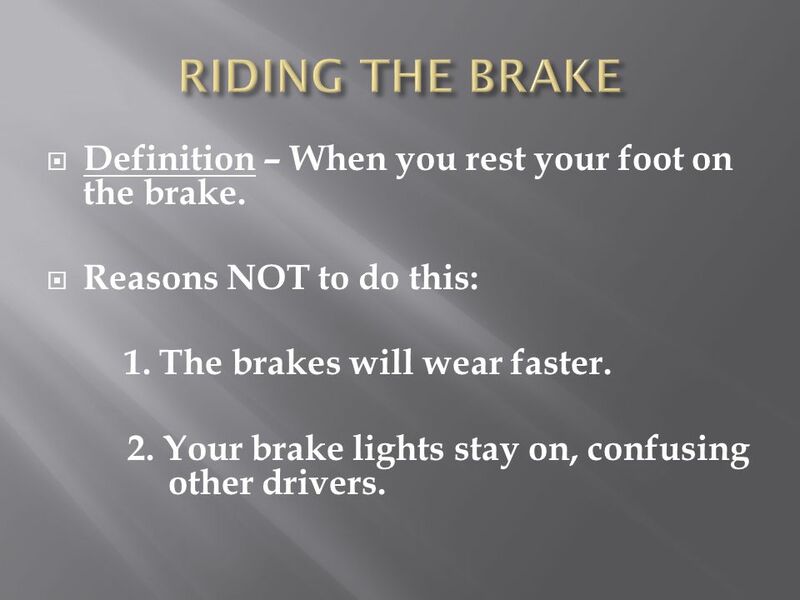 26 RIDING THE BRAKE Definition – When you rest your foot on the brake. Reasons NOT to do this: 1. The brakes will wear faster. 2. Your brake lights stay on, confusing other drivers. When to use the left lane: 1. When passing. 2. When turning left. 3. When the right lane ends. 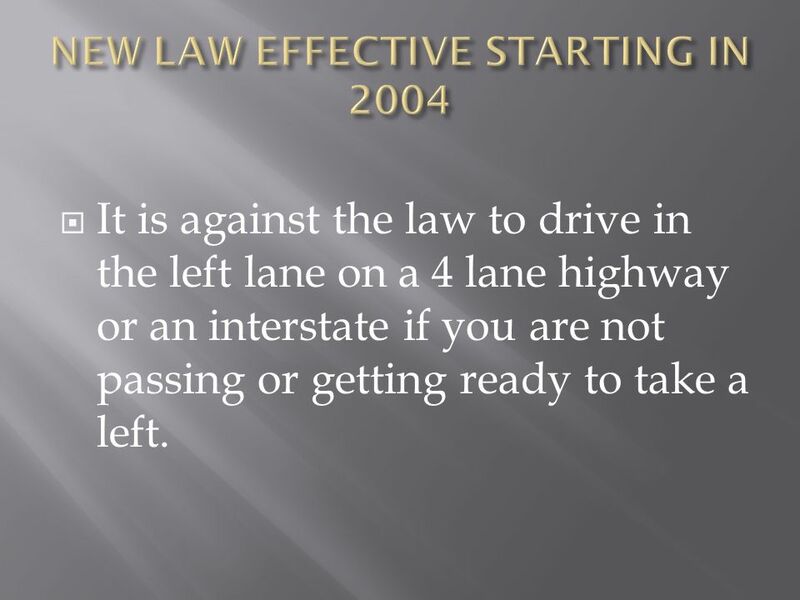 It is against the law to drive in the left lane on a 4 lane highway or an interstate if you are not passing or getting ready to take a left. 35 PASSING ON THE RIGHT 1. When 2 or more lanes are moving in the same direction. 2. 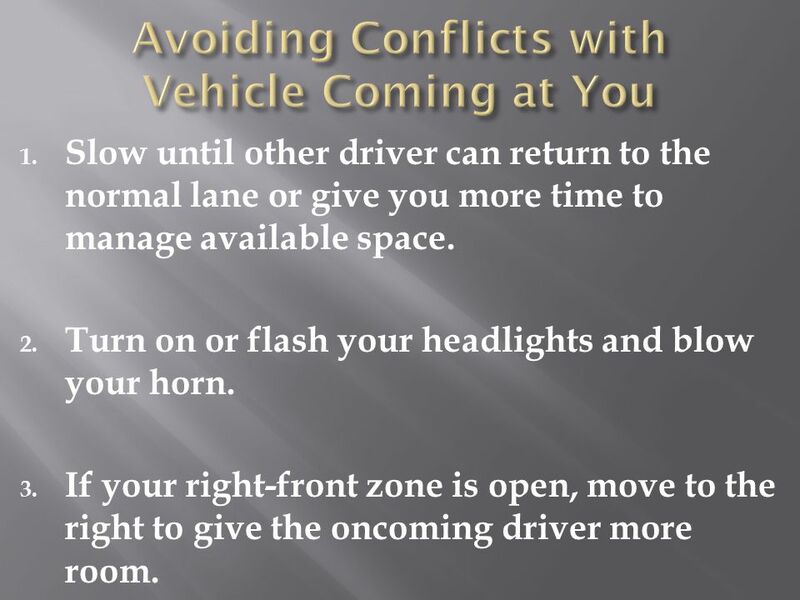 At an intersection when the car in front of you is turning left, if there’s room and if its safe. You cannot go off the road to pass on the right. 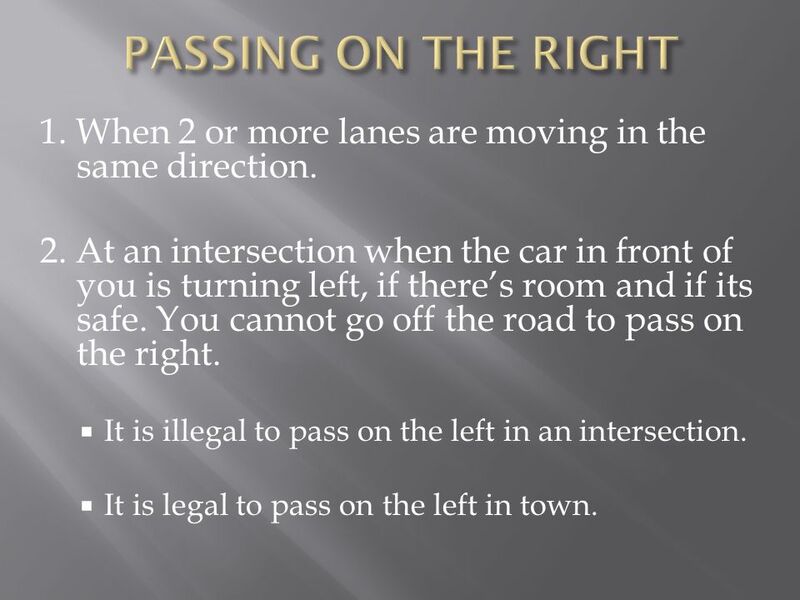 It is illegal to pass on the left in an intersection. It is legal to pass on the left in town. 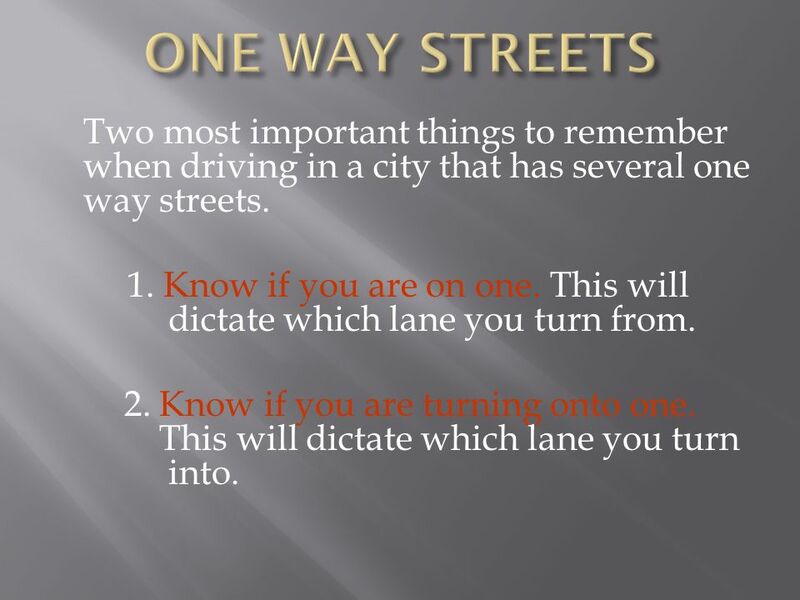 36 ONE WAY STREETS Two most important things to remember when driving in a city that has several one way streets. 1. Know if you are on one. This will dictate which lane you turn from. 2. Know if you are turning onto one This will dictate which lane you turn into. 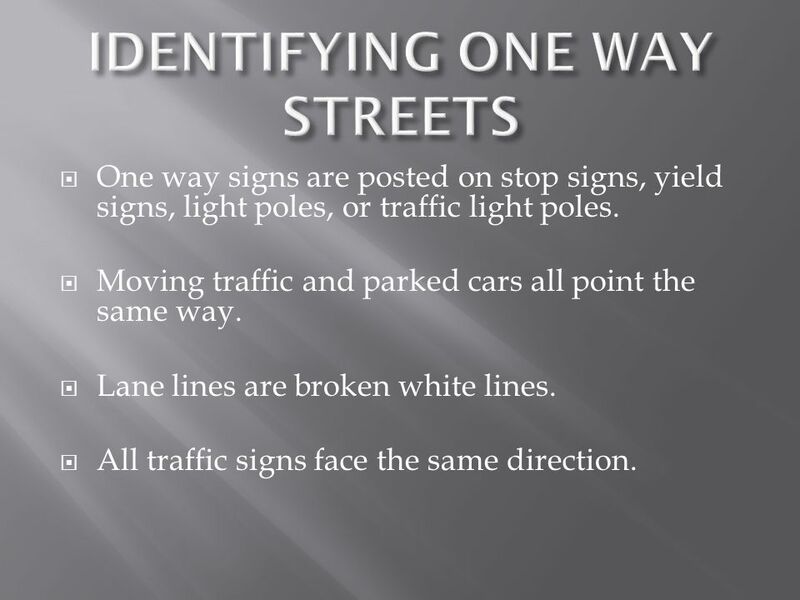 One way signs are posted on stop signs, yield signs, light poles, or traffic light poles. 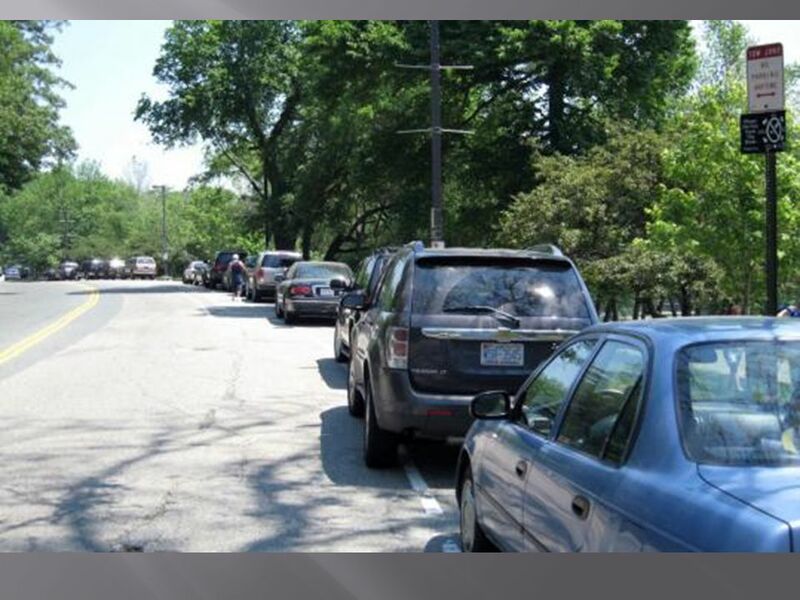 Moving traffic and parked cars all point the same way. Lane lines are broken white lines. All traffic signs face the same direction. 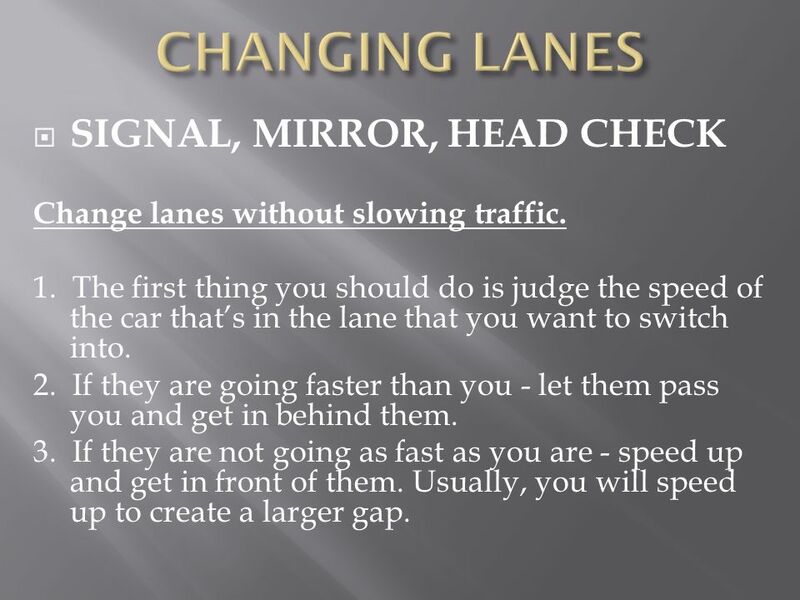 Change lanes without slowing traffic. 1. The first thing you should do is judge the speed of the car that’s in the lane that you want to switch into. 2. If they are going faster than you - let them pass you and get in behind them. 3. If they are not going as fast as you are - speed up and get in front of them. Usually, you will speed up to create a larger gap. 39 PEDESTRIANS When a vehicle hits a pedestrian, it will almost always be the vehicles fault regardless of the circumstances. 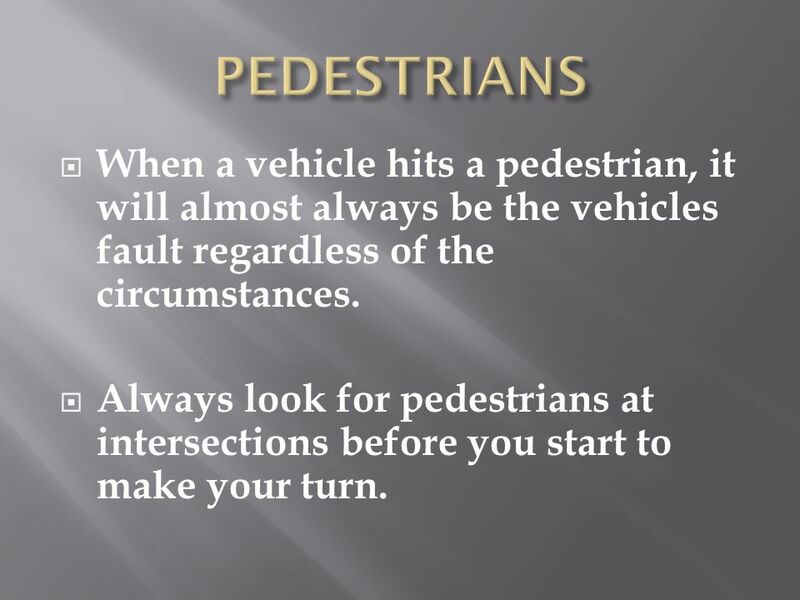 Always look for pedestrians at intersections before you start to make your turn. 40 EMERGENCY VEHICLES Safely pull out of their way and stop if possible. 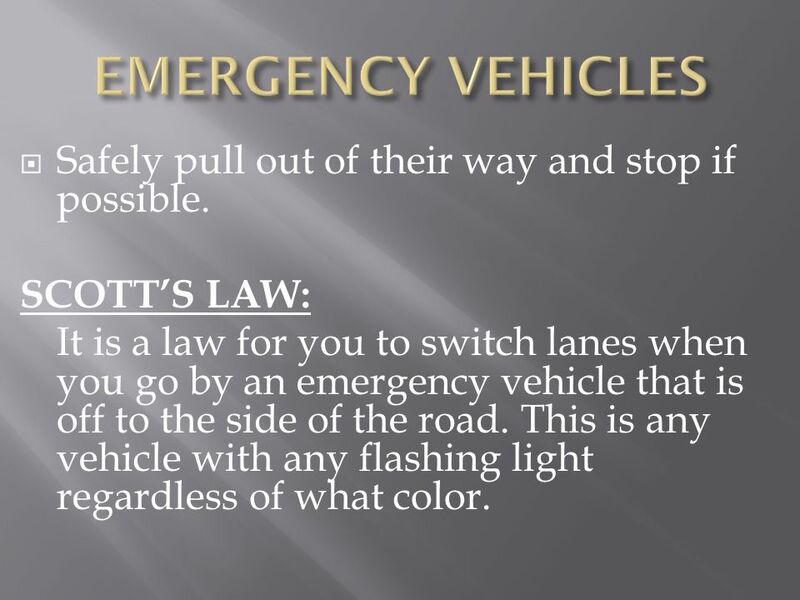 SCOTT’S LAW: It is a law for you to switch lanes when you go by an emergency vehicle that is off to the side of the road. This is any vehicle with any flashing light regardless of what color. 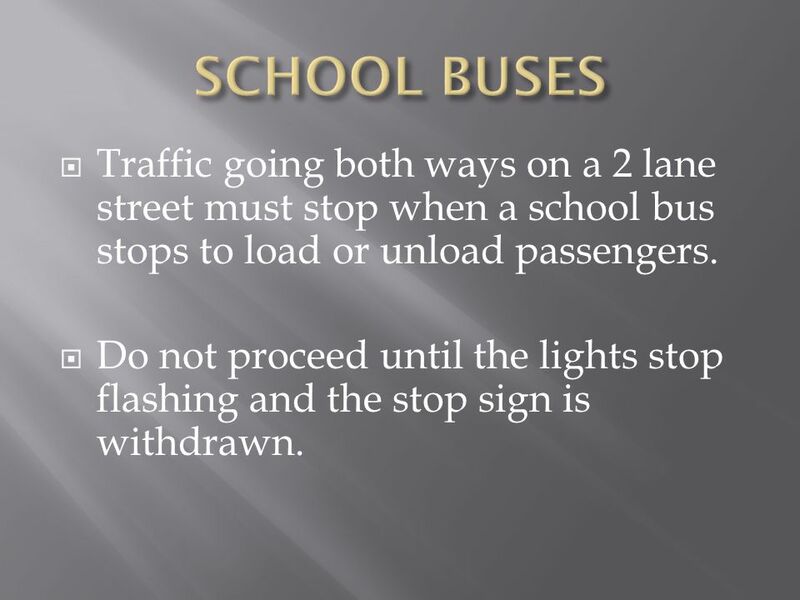 41 SCHOOL BUSES Traffic going both ways on a 2 lane street must stop when a school bus stops to load or unload passengers. 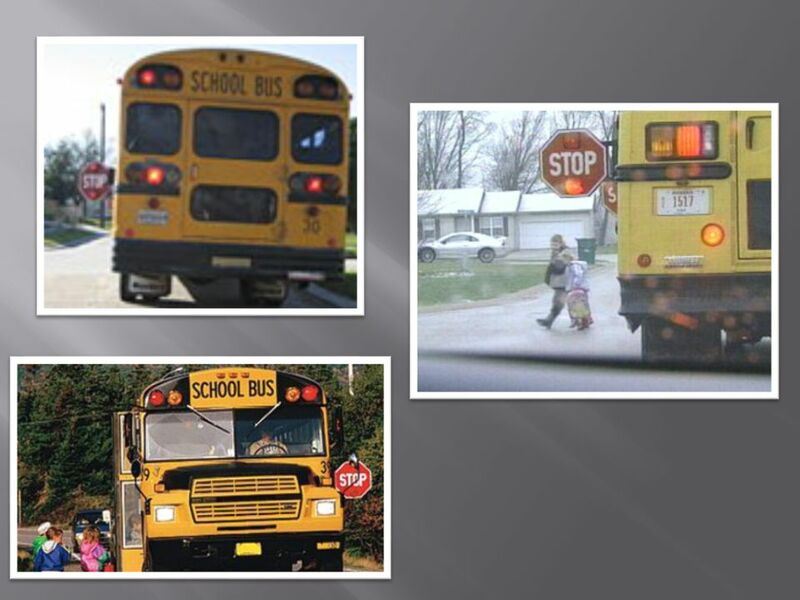 Do not proceed until the lights stop flashing and the stop sign is withdrawn. 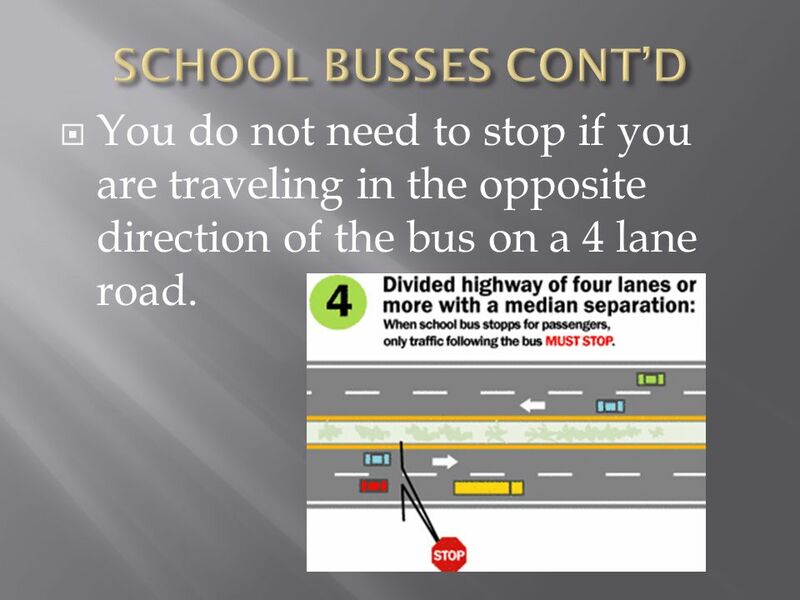 43 SCHOOL BUSSES CONT’D You do not need to stop if you are traveling in the opposite direction of the bus on a 4 lane road. 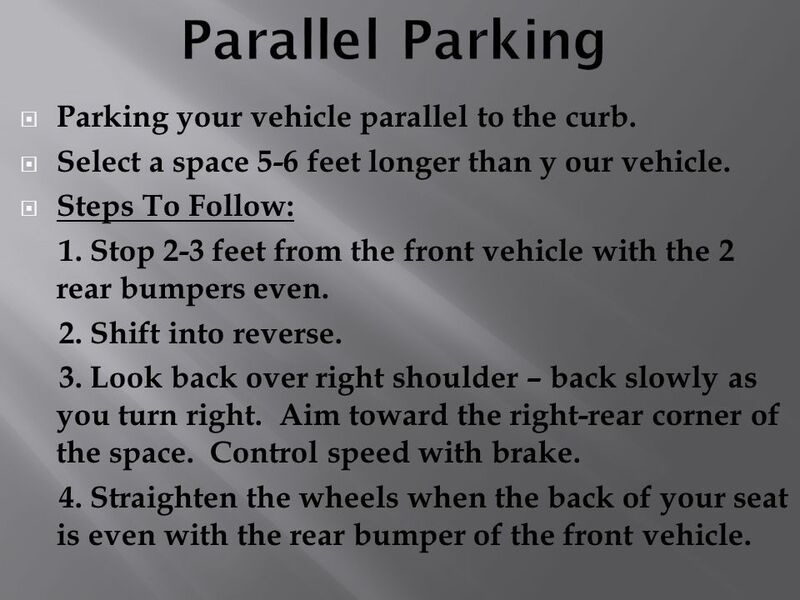 Position your car in the center of your parking space. 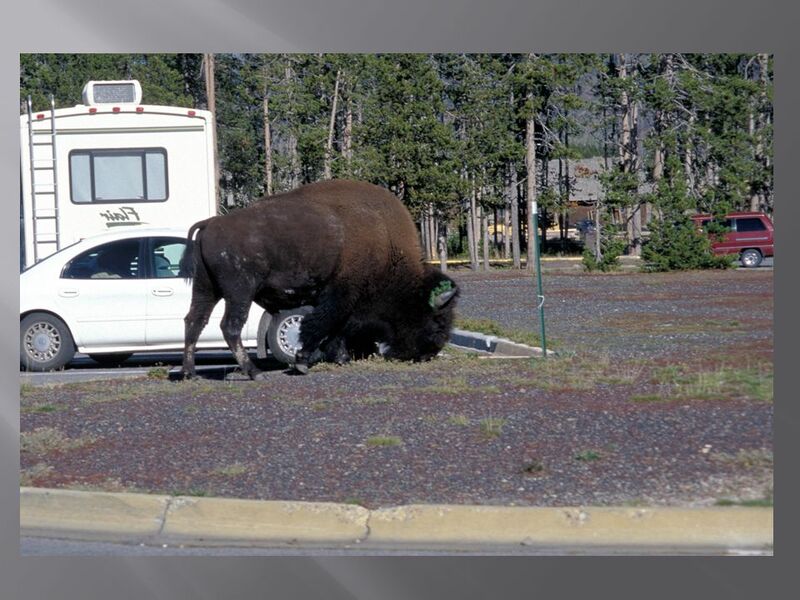 Do not swing your door into another parked vehicle. 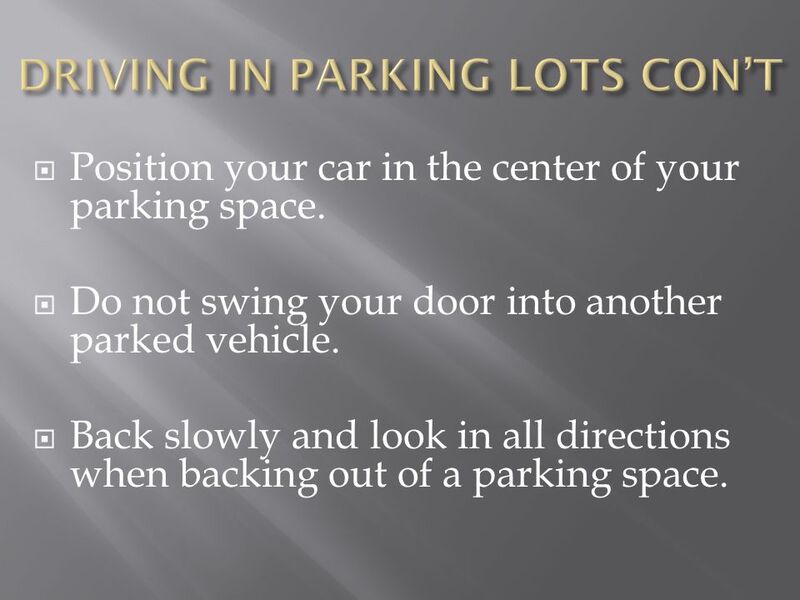 Back slowly and look in all directions when backing out of a parking space. Parking your vehicle diagonally to the curb. 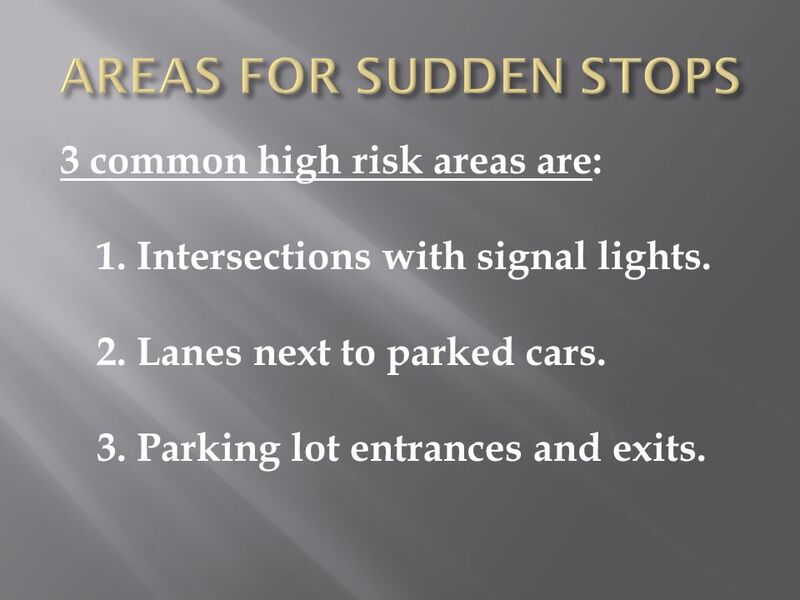 Usually in parking lots and shopping centers. Steps To Follow: 1. 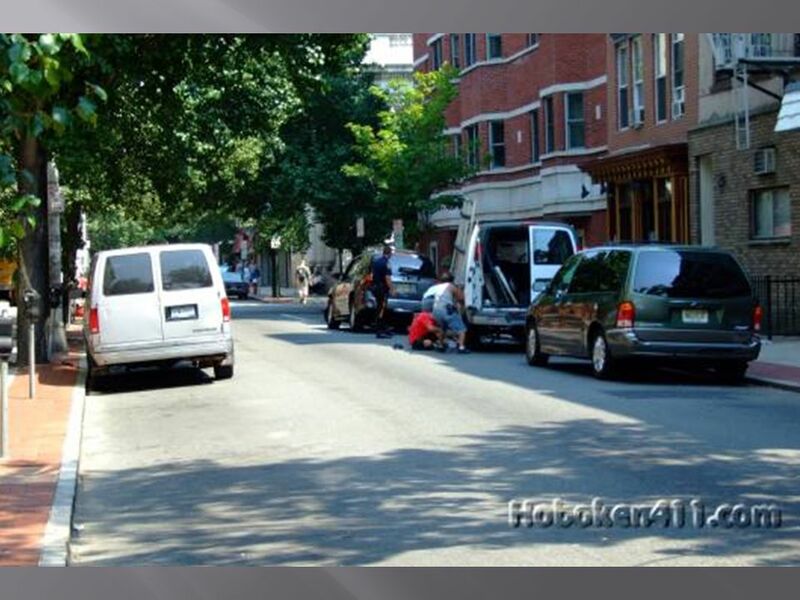 Position your vehicle at least 6 feet from the parked cars. 2. Check right blind spot and brake 3. 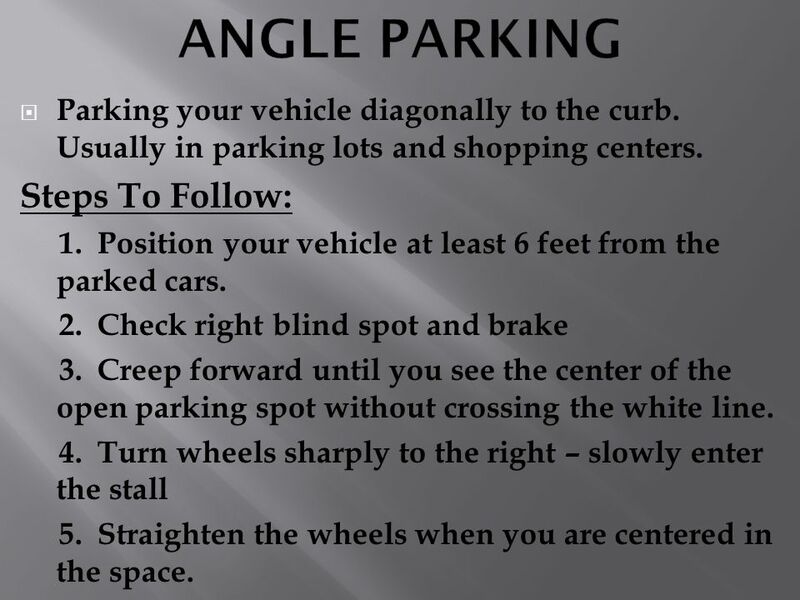 Creep forward until you see the center of the open parking spot without crossing the white line. 4. Turn wheels sharply to the right – slowly enter the stall 5. Straighten the wheels when you are centered in the space. Parking your vehicle at a right angle to the curb. Steps To Follow: 1. Position you vehicle at least 8 feet from parked cars. 2. Signal and check you blind spot. 3. Turn the wheel when your front bumper passes the left rear taillight of the vehicle to the right of the empty parking space. Check right –rear fender for clearance. 4. Straighten wheels when you are centered in the space. 50 Parallel Parking Parking your vehicle parallel to the curb. Select a space 5-6 feet longer than y our vehicle. Steps To Follow: 1. Stop 2-3 feet from the front vehicle with the 2 rear bumpers even. 2. Shift into reverse. 3. 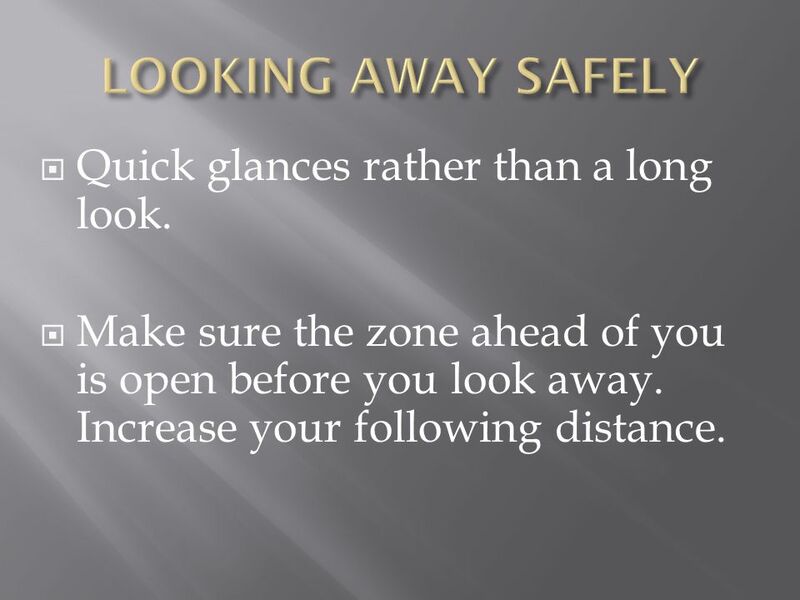 Look back over right shoulder – back slowly as you turn right. Aim toward the right-rear corner of the space. Control speed with brake. 4. Straighten the wheels when the back of your seat is even with the rear bumper of the front vehicle. 5. Once wheels are straight, slowly back looking over your shoulder through the rear window. 6. Turn your wheels sharply left when your front bumper is even with the front vehicle’s back bumper. 7. 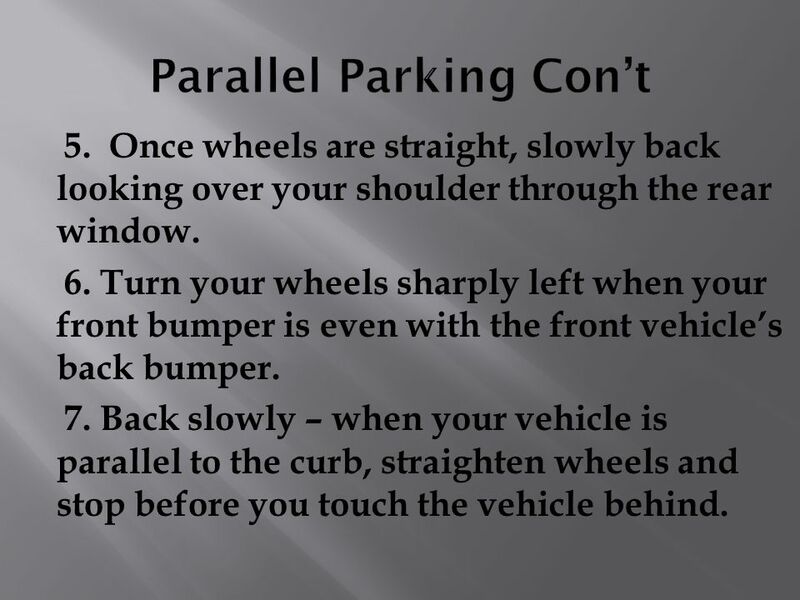 Back slowly – when your vehicle is parallel to the curb, straighten wheels and stop before you touch the vehicle behind. 53 SLOW MOVING VEHICLES The fluorescent orange center provides increased daytime visibility while the three red reflector strips are designed for lowlight or night time visibility improvement. 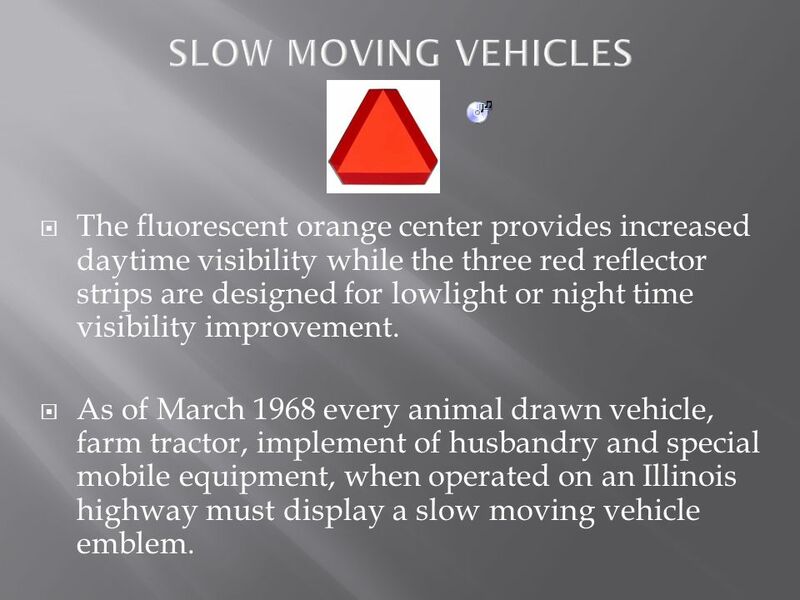 As of March 1968 every animal drawn vehicle, farm tractor, implement of husbandry and special mobile equipment, when operated on an Illinois highway must display a slow moving vehicle emblem. 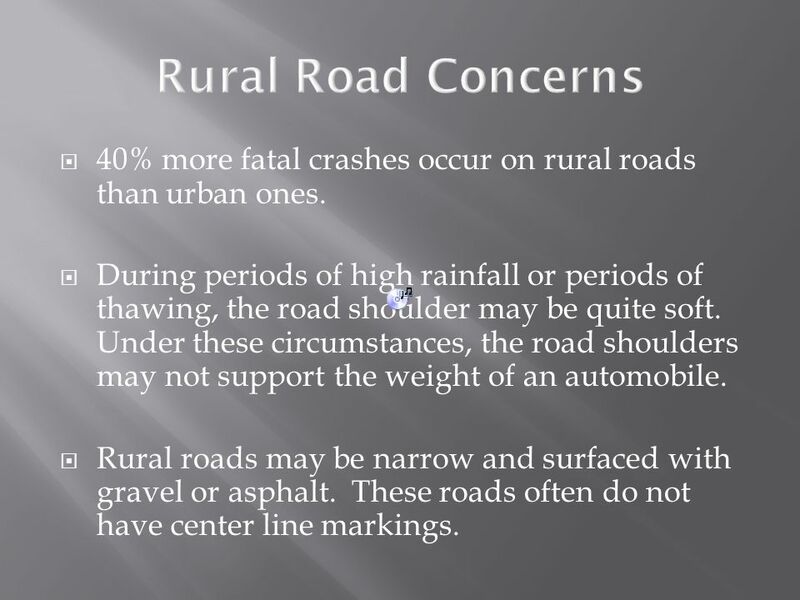 54 Rural Road Concerns 40% more fatal crashes occur on rural roads than urban ones. 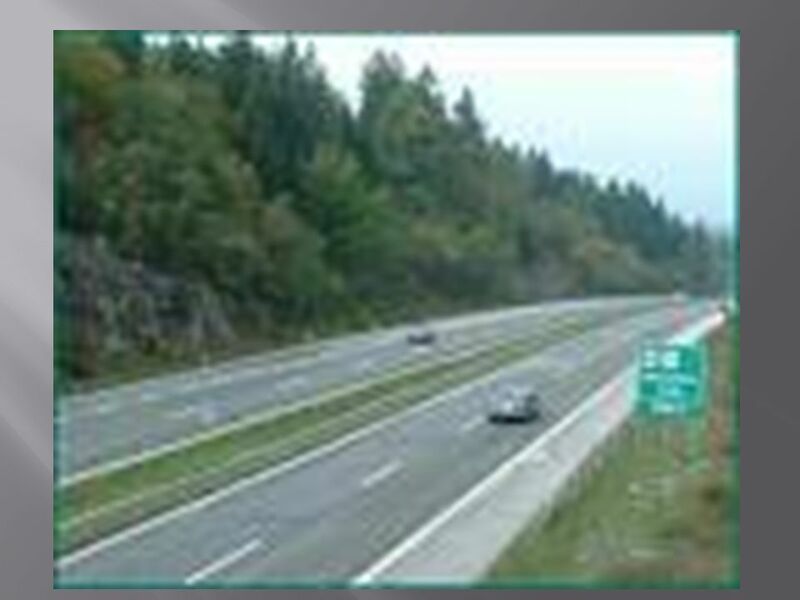 During periods of high rainfall or periods of thawing, the road shoulder may be quite soft. Under these circumstances, the road shoulders may not support the weight of an automobile. Rural roads may be narrow and surfaced with gravel or asphalt. These roads often do not have center line markings. 56 Writing Assignment Examine the picture on the next slide. You are the first newspaper reporter on scene. 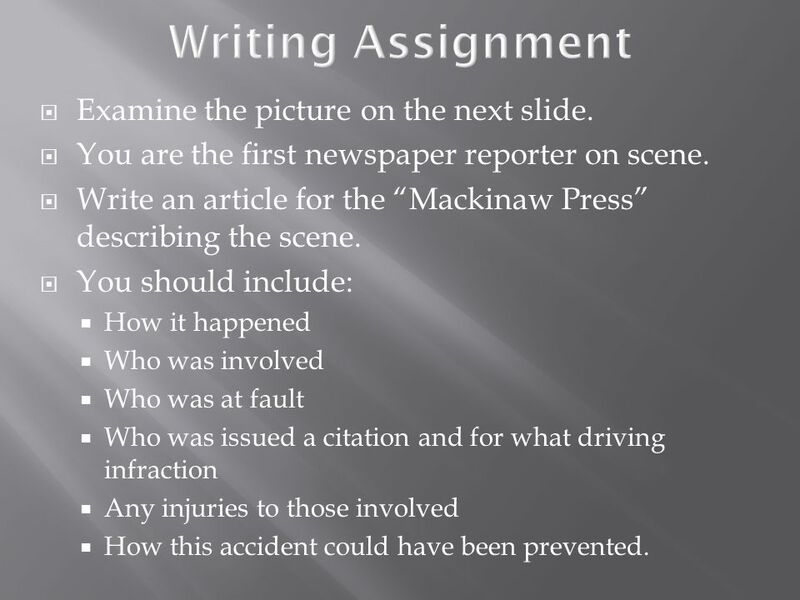 Write an article for the “Mackinaw Press” describing the scene. 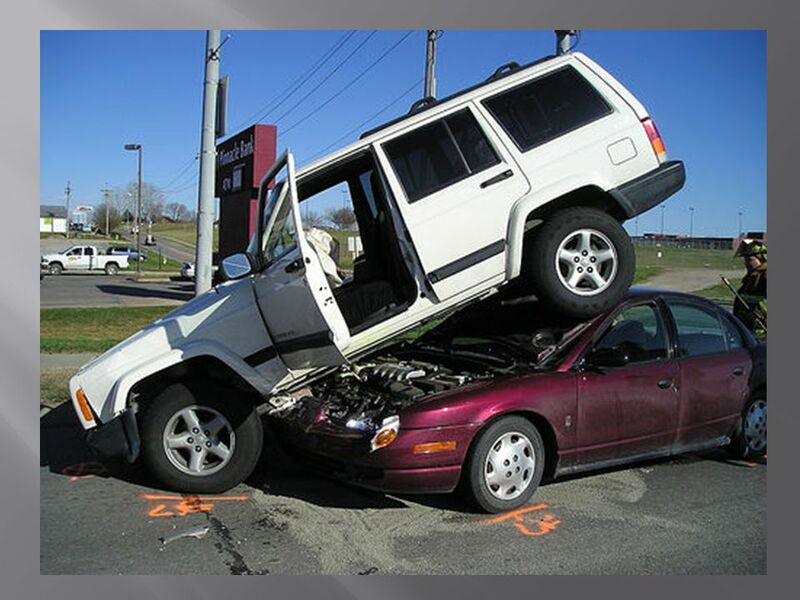 You should include: How it happened Who was involved Who was at fault Who was issued a citation and for what driving infraction Any injuries to those involved How this accident could have been prevented. 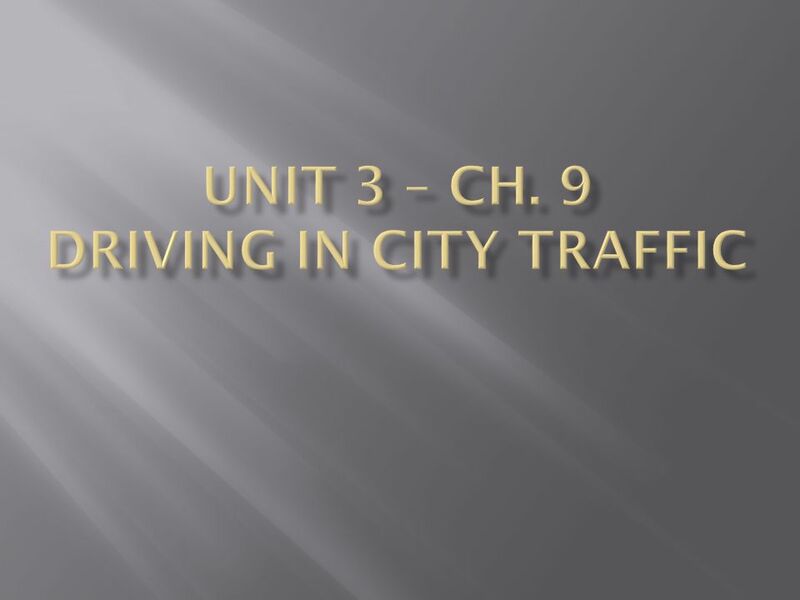 Download ppt "UNIT 3 – CH. 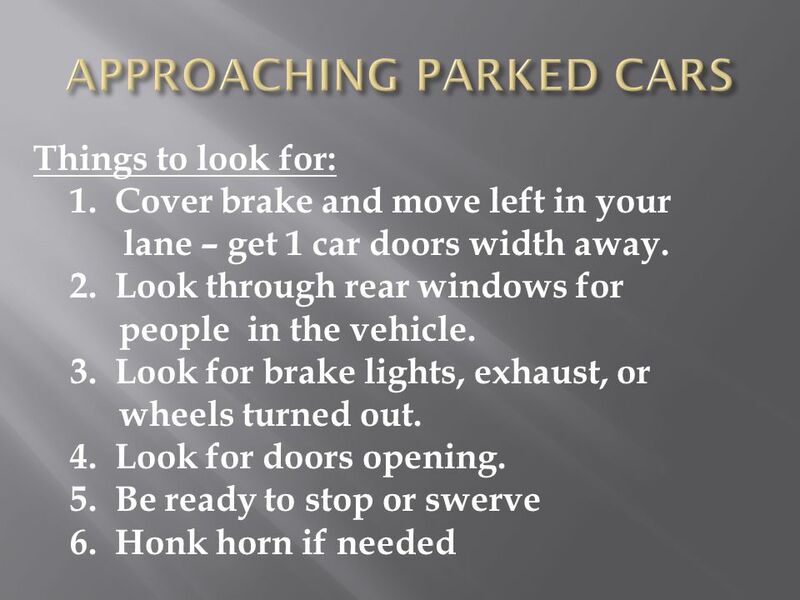 9 DRIVING IN CITY TRAFFIC"
Bell Ringer #3 1.List 3 places you should NOT park. 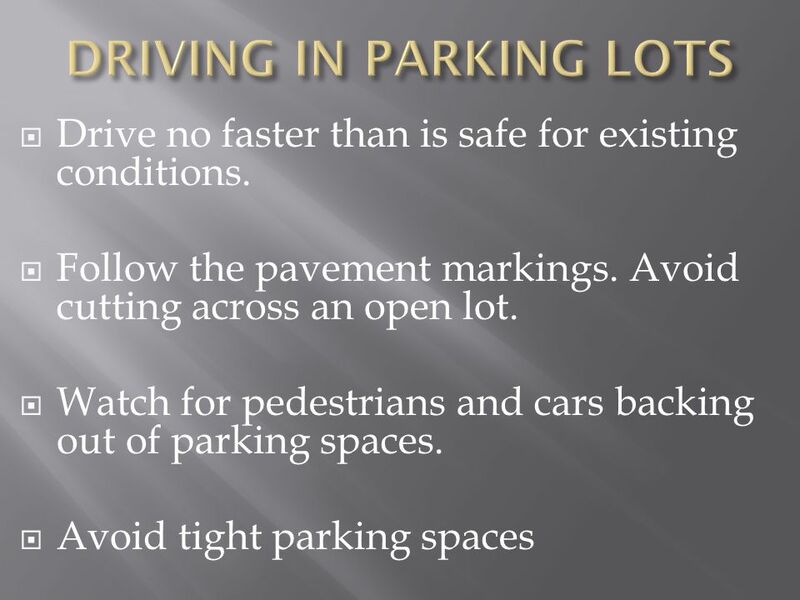 2.Oops…You just parked in one of those places that you’re NOT supposed to park…describe in detail what. 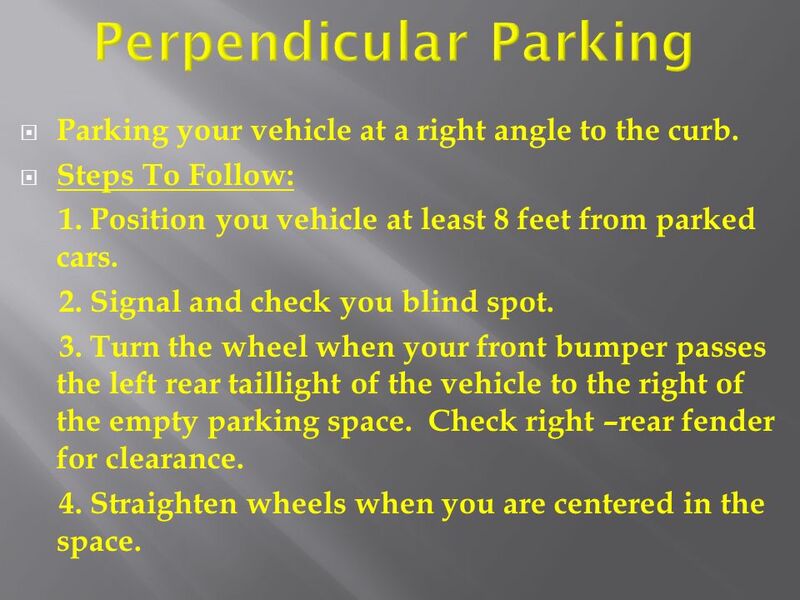 lesson 4.3 PARKING MANEUVERS Parking your car is a skill. 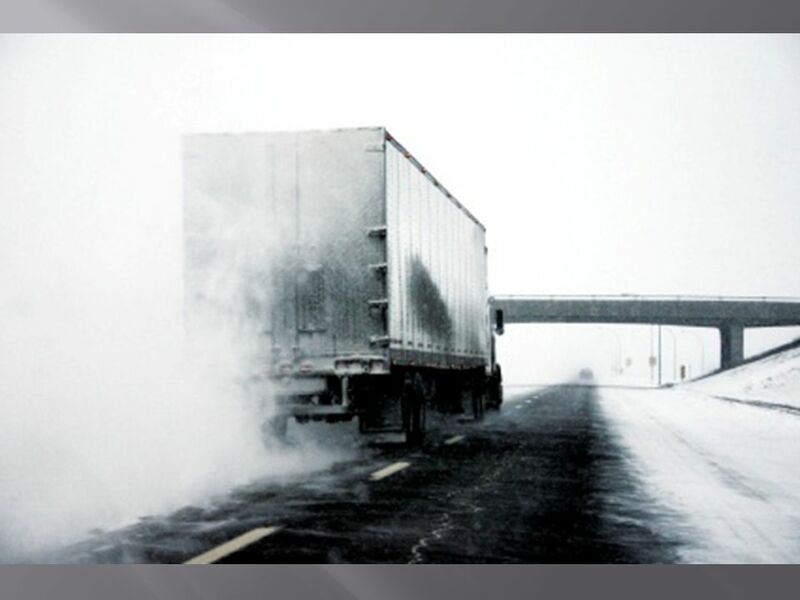 Transportation Tuesday TRANSPORTATION TUESDAY REAR ENDERS – HOW CAN WE PREVENT THEM? 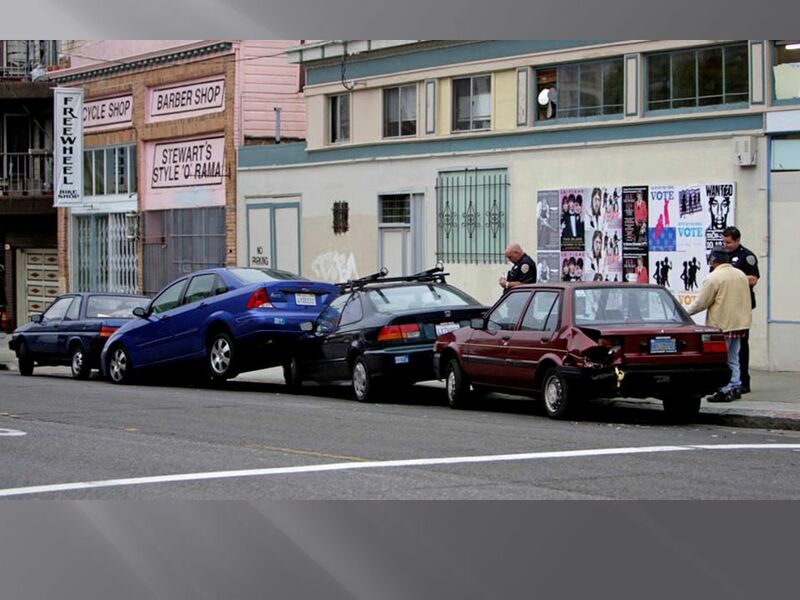 A collision occurs when two vehicles occupy the same space!